Usually when I do a Beer of the Week, I try to select a beer from I brewery that I have not written of before. A few weeks ago I was at Sessions, A Craft Beer Festival sampling a wide variety of beers. Muskoka Cottage Brewery was there and served up Teena's favorite of the day, Muskoka Cream Ale. They also served up a surprise for me. After sampling Double IPAs, Bocks, West Coast IPAs and the like, I was offered a Light Pilsner from the booth at Muskoka Cottage Brewery. I told the beer rep that it would not be a good idea after everything I have already tried, as it would just taste like water. He begged to differ, so I tried some. It stood up. I could smell and taste the hops, even though my taste buds were burned out. I knew I had to try this one again under more favorable circumstances to see what it really did taste like. With so many tastes in my mouth, I could not define whether or not this was a good beer. The rep told me that most breweries brew their light beers to a higher specific gravity so it hits around 8%, then dilute the product. 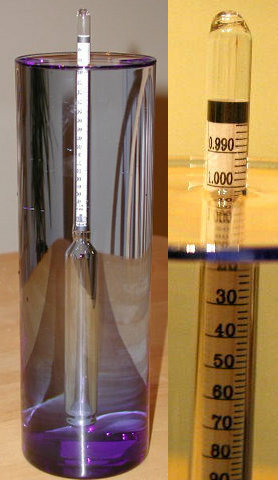 Specific gravity is measured by using a hydrometer which measures the density of sugars in a liquid. By applying a formula to determine the amount of alcohol in a liquid. I could find no exact proof that breweries do brew their light beers in this manner but most websites I visited seem to lean this way. Muskoka brews their light beer to the specific gravity that is 4%, so there is no need to dilute. So after writing about this brewery before, here I am at it again. You know this brewery is located in a small town when you read the address as posted on Bracebridge's website as "Located at 13 Taylor Road, by the railway tracks." I like that. Something they mentioned too which I was not aware of was that the brewery is located in a historic building which was a granary in the very early 1900s. It pours a light golden colour with a white head. Although the head dissipated, it did not fully disappear, which I have found in some other beers. There is a detectable aroma of hops which comes from the glass. This gives me hope. On taking my first sip, I was pleasantly surprised. There is a strong hop presence that lasts through-out. The beer is refreshing and hoppy, ending on a sour note than a bitter note. Lacings do remain on the sid e of the glass as I sip away. This is indeed a very good beer. I would not guess that this is only 4% alcohol as it is full of flavour and equal to many Pilsners I have tried before. I have been looking for a good light beer, one with flavour. I am on Weight Watchers and light beers do not cost as many points as a regular beer. This one would make a good session beer, not costing me as many points while having a few. There are many great beers out there, so many I enjoy and will always be regulars in my fridge. Now I have another to go with them. Never figured a light beer would become one of my regular stock. Thanks for the great review on our Muskoka Pilsner. We are pretty pumped with the response so far. Sales have been good and reviews have been very good. Please let us know if you find yourself heading to Muskoka. We'd love to get you to the brewery for a pint or two. Tried 2 cans last night out of a few sample packs, and I was very impressed! Anybody know if this is going to be on sale in beer/liquor stores? I have bouoght it from both the LCBO and the beer store. The beer store is better as you can buy a dozen for less.